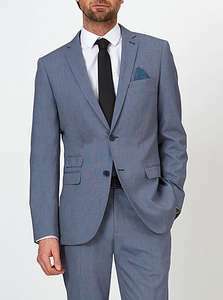 Make a statement with this stylish suit jacket. Cut in a slim fit with an integrated pocket square to keep you looking smart all day, it’s a style which will suit a range of looks from your formal wardrobe. One for the Labour voters being sent to job interviews. Guaranteed back on your arse watching afternoon telly! One of the reasons they are reduced? Rather pointless as well if you ask me. No one wants to wear a non matching suit unless It's a warmer type of jacket that could be combined with Chino's on a non formal occasion. One for the Labour voters being sent to job interviews. Guaranteed back on …One for the Labour voters being sent to job interviews. Guaranteed back on your arse watching afternoon telly! Where's the ignore button gone? Anyone?